SuperGreen is rich in nutrients vital for the body’s health. The powders of several green plants contribute to creating an alkaline environment, cleansing the body from waste products, and boosting the immune system. SuperGreen contains moringa, which is of exceptionally high nutritional value with its 90 different nutrients and 46 antioxidants that ward off the onset of various pathological conditions. 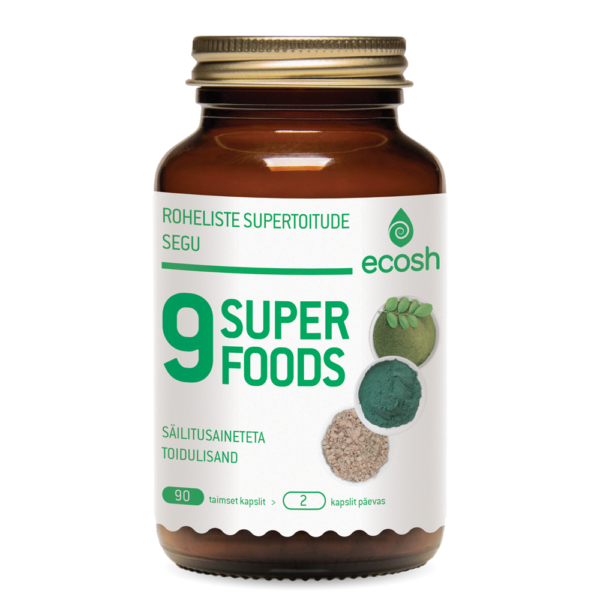 Spirulina and chlorella are rich in beneficial phytonutrients like beta-carotene, chlorophyll, and other similar compounds that aid the body in eliminating toxins and heavy metals. Due to containing various types of bioactive compounds, alfalfa, wheatgrass, and other green powders are stimulating, lower fatigue and drowsiness, and enhance efficiency and vitality. Grain sprouts contain large amounts of beneficial fibers that aid the digestive process and stimulate intestinal peristalsis. Ingredients: Moringa oleifera, spirulina, common wheat, chlorella, lucerne, amla (Embelia ribes), couch grass, jiaogulan (Jioagulan gynostemma pentaphyllum), bamboo leaf powder (Phyllostachys edulis), vegetable capsule (hydroxypropyl methylcellulose). Suggested use: 2 capsules daily The contents of the capsule could be sprinkled and stirred into meals or the capsules can be taken with water with a meal. Recommended period of use: periodically or all the year round.